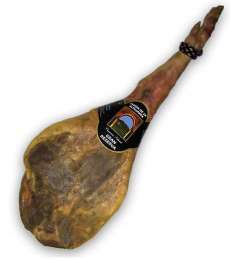 Serrano ham or Jamon Serrano is a Spanish dry-cured ham and is widely regarded as a national treasure. 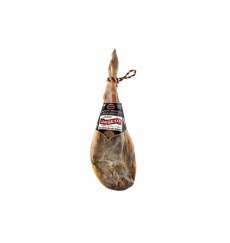 It is made from native Spanish Iberian pigs and is slowly air dried. 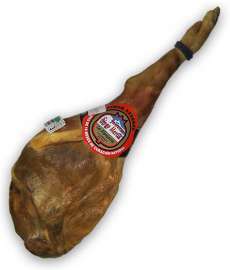 Serrano ham is one of the most highly rated hams in the world and is only made in Spain. Hams made from pigs fed on acorns and aged for as much as four years are particularly highly regarded. 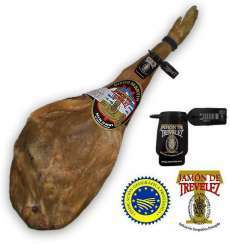 Jamon serrano literally translates as 'ham from the sierras' or 'ham from the highlands'. 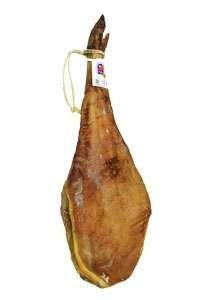 Where can I buy Jamon Serrano? Jamon Serrano is an important part of the Spanish culinary tradition and Spaniards eat more Serrano ham per person than any other country in the world. In a Spanish kitchen, it is not unusual to see a whole Jamon Serrano resting on a stand, ready to be cut, a few slices at a time, when anyone it takes anyone's fancy for a snack, or to be used as tapas or as an ingredient for a recipe. There are four distinct stages of the production of Serrano ham; salting, resting, dry-curing and ageing. In the salting stage, the jamon is covered with a layer of sea salt and left for a couple of days per kilo of meat - usually about a week. The ham is left in a warm and damp curing area. The salt prevents the meat from decaying and effectively stabilises the ham. The ham is then left to rest as the salt gradually sinks into the meat and absorbs the moisture. The ham is then thoroughly rinsed to remove any salt crystals remaining on the surface. The ham then undergoes a process known as dry curing, when the outside temperature is gradually increased and the levels of humidity decline. This stage takes about six months. Ageing is the final process. Time is an essential ingredient to allow the fine and delicate flavours to develop. This stage can take between six to eighteen months, depending on the size of the ham and the climatic conditions. Dry cured hams have been made in Spain for thousands of years; there are documents referring to them dating back to the days of the Roman Empire, although the practice of curing hams in the region is believed to have been already long-established. From the earliest days, the production of this kind of ham has been remarkably simple - people using what nature has given to preserve the pork. This was essential in times without refrigeration to prevent the pork from rotting and going to waste. All that is needed is sea salt, the right weather conditions and sufficient time. In the past, fresh hams were cured in areas of high altitude such as mountains - areas which are dry and hot in the summer months and cold in winter. The cool mountain air was perfect for the slow ageing of the hams, helped by the initial layering of the sea salt. The curing process traditionally started in the first two weeks of November, at the beginning of the cold season. The first part of the process was a ritualistic killing of the native pigs. For hundreds of years, people kept a few pigs, usually on small holdings, and sacrificed the domestic animals that had been slowly fattened over the summer months. It is, perhaps, unsurprising that the Spanish verb for 'slaughter' is 'sacrificar' a term that encapsulates the respect that the Spanish historically felt for their animals and the food products that they would become. This ritual slaughter was referred to as the 'matanza' and was a time of rejoicing - all the community would have been involved. The pigs were butchered and no parts of the animals were wasted by the frugal villagers. The newly jointed hams were first covered in sea salt to start the curing process. After a few days, the hams were rinsed and then hung in airy curing sheds. These were - and are - large dark places, with a small high window, kept open to allow the air to circulate. Whilst hanging, the hams were exposed to the mountain air and its varying qualities with the changing seasons. 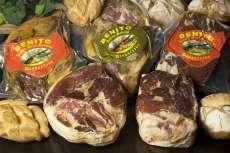 After about twelve months, this process resulted in the famous dry-cured Serrano hams that were now ready to be eaten, without any additional preservative, additives, or any other human involvement. If you are planning to buy a whole jamon Serrano, it is important to know how to look after it, to make the most out of every delicious bite. Keeping it in the fridge is fine but take it out for a while before serving, as jamon Serrano is always best served at room temperature. Once cut, the jamon should be quickly eaten. Store it in a cool and well-ventilated area, either hanging by a rope or on a designated stand ( known as a jamonero in Spanish). Jamon Serrano is typically served in thin slices. After you have cut into the ham for the first time, cover the exposed area with a plastic wrap or butchers' paper to preserve the moisture of the interior of the ham. Some households use the discarded fat as a covering in place of a plastic wrap. If the jamon has been exposed, it will quickly become dry and tough. If this happens, simply cut away the top layer. Cut the fat away from the sides and the top until you can see the meat with a sharp knife. When you get down to the bone, the jamon is tricky to slice neatly, it is, however, delicious in stews and soups. The ham bone can also be boiled to make an excellent stock. 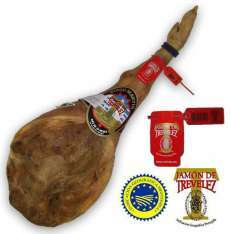 Over time, you may notice patches of white mould on the exterior of the jamon. This is completely normal and a part of the maturation process. If it is bothering you, however, simply wipe it away with a peice of kitchen towel dipped in some vegetable oil or a clean damp cloth. Serrano ham is best-enjoyed cut into slices and served with fresh crusty bread, perhaps with a little olive oil drizzled over it. As well as tasting delicious, Serrano ham is acknowledged to be an excellent source of protein and essential vitamins such as B1, B2, iron, and phosphorus. Jamon Serrano can be easily digested and contains high levels of unsaturated fats which are believed to help regulate cholesterol levels. 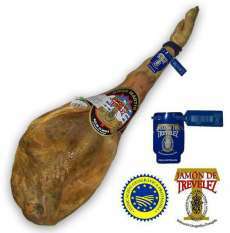 The best Serrano ham can be bought online at SpainFlavor.com. It has never been easier to enjoy the magnificent Serrano ham!